I speak and lead workshops for teachers around the country. A literacy instruction workshop, ideal for grades 5-12 and applicable across the content areas. It's based on my book, These 6 Things: How to Focus Your Teaching on What Matters Most. Participants in over 25 US states have called it among the best PD they've ever had. To learn more, definitely read the book (or at least buy it for that one teacher in your building who reads all the books so that they can read it and then tell you what they think). If you'd like a sense for my style, you can see this clip of me speaking live at an NCTE conference several years ago. What you will notice is that I am down to earth and straightforward. I don't bring a lot of singing and dancing and edutainment to the table. If that's what you're after, much love to you as you continue seeking a PD provider. Past audiences have appreciated my down-to-earth style. Two keynotes: one on student motivation, one on teacher flourishing. The motivation keynote I've given this for teachers about students, and for administrators about teachers. It's based on the researched-laden “five key beliefs” framework that I teach in the second chapter of These 6 Things and in my all-online, schedule-friendly “Student Motivation Course,” which over half a thousand teachers worldwide have called career-shaping. I appreciate your candidness and can only say please continue to deliver PD in the same straight-forward manner. I most appreciated your total understanding of a teacher's job because you ARE a teacher. What a difference that makes in PD. You are honest, and that means a lot since you are in the trenches like us. You know the challenges. I appreciated your wit, your sense of humor, and your relaxed sense of being. Your students must love you! I appreciated that you gave us just the right amount of time for table discussions and action planning; you also showed us video of some of the strategies as you use them in your own classroom. I'm a 9th grade history and English teacher from Cedar Springs, MI. I began my teaching career in 2006. I've written three books: one on a focused approach to literacy and mastery across the school day (Corwin Literacy), one on literacy standards (Jossey-Bass Wiley), and one on teacher mindset (self-published). 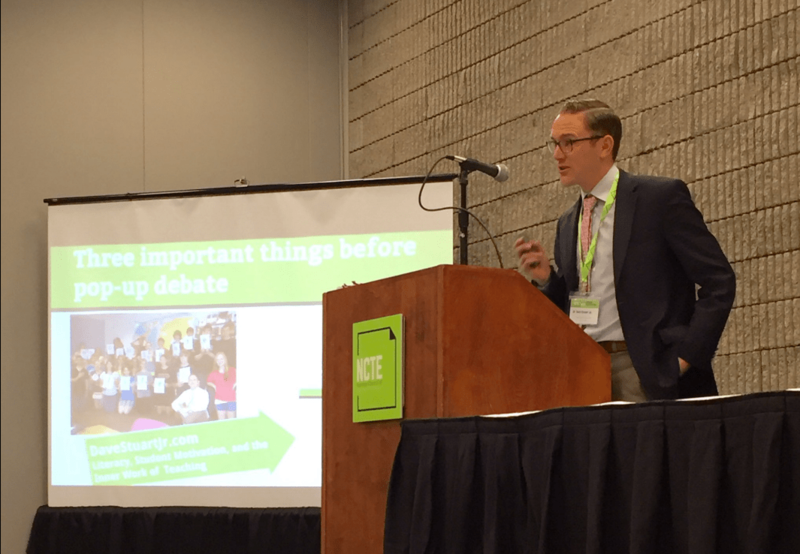 I've keynoted at state-level conferences and universities, led workshops for teachers around the country, received a national Teacher Innovator Grant from Character Lab, and been twice recognized as a finalist for Michigan Teacher of the Year. Here are the speaking/training engagements I've done since the start of 2013. These speak to my ability as a PD facilitator as well as my ability to speak to larger audiences in keynote settings. To learn more about me, check out davestuartjr.com.